At the Community Food Pantry of Sleepy Hollow and Tarrytown, volunteers gather in the evening once a month to stack the shelves and prepare fresh vegetable bags in preparation for the next day’s distribution. 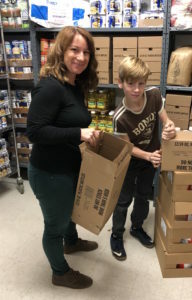 This week, teens and adults worked to fill the shelves with staples, while over 250 bags were filled with beets, carrots, squash, pears and apples. Kids’ Club is proud to continue our support of this vital organization, which feeds an average of 245 families each month, and thanks all those who donate their time, talent and treasure to feeding our community.